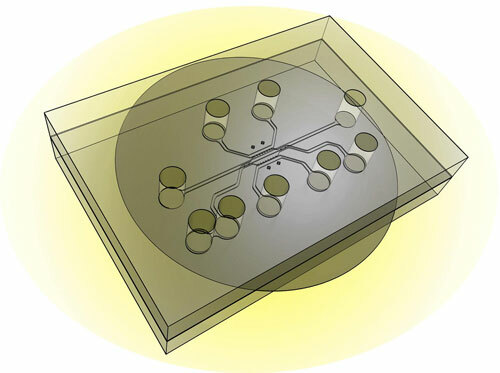 (Nanowerk News) Researchers have developed a chip capable of simulating a tumor's "microenvironment" and plan to use the new system to test the effectiveness of nanoparticles and drugs that target cancer. The findings are detailed in a research paper ("Simulation of Complex Transport of Nanoparticles around a Tumor Using Tumor- Microenvironment-on-Chip") appearing online this month and will be published in a print edition of the Journal of Controlled Release in November. The paper was authored by postdoctoral research associate Bongseop Kwak; graduate students Altug Ozcelikkale and Crystal S. Shin; Kinam Park, the Showalter Distinguished Professor of Biomedical Engineering and a professor of pharmaceutics; and Han.